Besides being the largest event for popular art culture in America, Comic Con also boosts loads of super heroes. Most will define a super hero as a character like Spider Man from Marvel. At two panel discussions in the big Ballroom of the SDCC Deepak Chopra and Grant Morrison got down and dirty with these concepts. Grant and Deepak shared that this idea of the super hero is something that each of us aspires to and might just be attainable. I believe it is. We only use 3% of our brain, don't you think if we used 100% we might have some of those super hero capabilities? These heroes are reminders that these archetypes are embedded deep within our psyche, which is why Comics, SciFi and the Fantastic are such popular genres. 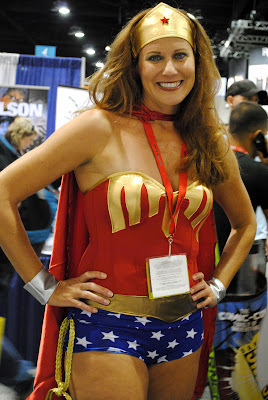 The other type of hero prevalent at Comic Con is the celebrity, usually an actor like Angelina Jolie. For me the super heroes are the master writers and visual artists, these are the folks that the first Comic Con, in 1970, was all about. I had the auspicious fortune to speak to some of my heroes like JJ Abrams, who I spotted while he leisurely strolled the convention center looking for toys. The moment I saw him, I shot up from my chair and quietly walked up next to him. I had no idea what to say so I expressed my gratitude for his mastery at story telling. On another occasion I met the two producers and cast of the only TV show I watch, Fringe. There seems to be this ridiculous nervousness that comes over me when I meet folk of high mastery. Even holding a strong intention to stay relaxed and present I find myself in "awe mode" and have a hard time accessing my brain capacity. It's so silly. I did manage to get out a few coherent thoughts to both Jeff Pinkler and JH Wyman, the producers and masterminds of Fringe. I asked JH Wyman if they planned to incorporate the honey bee into the story line of Fringe. He said he has been thinking about it quite a bit and enjoys weaving in story elements that relate to current situations. He expressed that he really likes to get people thinking. My kind of guy...my hero! I also met and attempted to communicate with the cast, they were all there but I got "froze mouth" and wasn't able to say much. I did ask the actor Joshua Jackson, who plays Peter, if he lived here in Topanga. He said "Yes, but lately I've been mostly in Vancouver...which actually has a similar vibe to Topanga." Indeed! Maybe I'll run into Joshua at our local farmers market or post office....but what to say?